The ‘Million Dollar Sale’ launched by Hotwire this week reduces the price of Las Vegas 5 star hotels to an astronomically low rate of $50 a room per night for a limited time during the month of December. According to the Luxury & Holiday Travel Survey, the biggest impediment to staying at 5 star hotels is the price. Duh! I mean doesn’t everyone prefer to be pampered in luxurious surroundings? Especially during the holidays when we are all super stressed out.. But how many of us can actually afford this during the busiest shopping month of the year? Well, now we can with the help of Hotwire. Some of you may already know of Hotwire as a one-stop site for booking airline tickets, hotel rooms, rental cars and more. For those of you who didn’t know, now you do! Hotwire has been around for 20 years helping last minute travelers throughout the US. Basically, Hotwire works with thousands of companies to sell unsold inventory at the last minute. Often times, this results in crazy cheap discounts on fabulous travel options. For Hot Rate specials like the Million Dollar Sale, the only catch is that the name of the hotel (or other brand) is not released until you have actually made your purchase. This is done to protect premium brands who normally would not offer such low rates. For the company at hand, they get to fill empty rooms, seats, etc and you get the benefit of luxury at bargain prices. You just have to be flexible and trust that Hotwire will provide you with an outstanding company. As a family traveler, I’ve become quite addicted to the luxury of 5 star hotels that I often seek out the most luxurious places I can for the cheapest price tag. So Hotwire is right up my alley. Why would Hotwire do something like this? According to the new president Neha Parikh, Hotwire offers crazy good deals on travel and she wants to prove it through this promotion. By investing 1 million dollars into their already Hot Rate deals, they can make luxury properties in Las Vegas accessible to more travelers, right in time for the holiday season. I know, it sounds too good to be true, but it is happening right now! The only catch is, once the money saved by consumers reaches 1 million dollars the sale is off. This could happen in a matter of days or could take longer, so jump on this ASAP! Predictions say that it could all be over well before your Thanksgiving turkey has even defrosted! Think about it. Average 5 star rooms cost around $400 a night, meaning with this deal, a $350 savings per night. How many rooms need to be booked to reach the million dollar mark? Not as many as you think, so head over to Hotwire now to start searching for your dream hotel! Once you land at Hotwire, enter in any dates between December 8-28, 2017 and wait for the options to appear. When booking your stay, note that the $50 rates are only available for a maximum of 2 nights and are with participating hotels only. As with other Hot Rate deals on Hotwire, you will not know the hotel until after booking. You will however know the star rating of the hotel, the review rating and general location of the hotel. Reading the fine print I see that rooms are based on double occupancy with possible extra fees with additional guests (take note families!). Additionally, prices do not include taxes or resort fees, which can add up, but will still be significantly cheaper than rack rates! Resort fees will be provided before you click the book button, so you will have a general idea of how much each particular hotel will set you back. For those of us in SoCal, it feels like this deal was made for us. Las Vegas is the perfect place to escape the holiday madness for a few days since we can just hop in the car and be there in a flash. 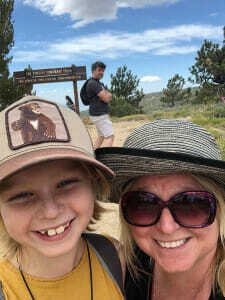 The weather is beautiful this time of year and you can get off the strip for some awesome hiking nearby which makes it a dream for outdoor families. I’m looking at dates for the week before Christmas. What about you?